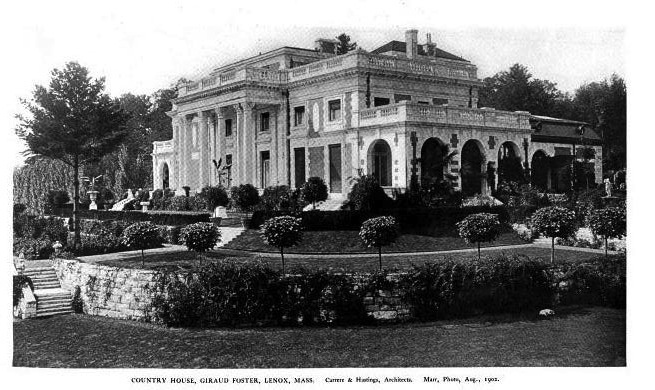 'Bellefontaine', the Giraud Foster estate designed by Carrere & Hastings c. 1897 in Lenox, Massachusetts. Foster was the grandson of Andrew Foster, founder of Foster & Giraud, one of New York City's leading merchants in the second half of the 19th century. 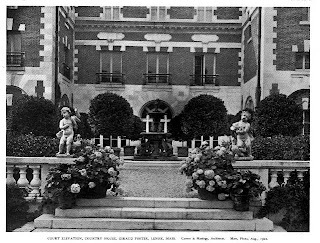 Foster's sister-in-law, Mrs. Richard Gambrill, hired Carrere & Hastings to design her 'Vernon Court' in Newport, Rhode Island during the same time the firm was busy with 'Bellefontaine'. Foster died at the house in 1945 at the age of 94. Click HERE for more on 'Bellefontaine'. Today the estate operates as a Canyon Ranch Spa, click HERE to see 'Bellefontaine' on google earth and HERE on bing. Fantastic design of the sunken entry courtyard pergola and reflecting pool. Unfortuante that the interiors have been lost. P.S. Up above, Zach links to a short history of the Fosters. In case you skipped it, go back and read it. The part about their son -- Boy Foster -- is priceless. One of the criticisms made of the grounds of Bellefontaine, even in its own day, was the almost promiscuous scattering of statuary and sculpture, with poor relationship of scale and placement. even when nearby estates were tumbling into degredation and ruin. And when Giraud Foster held his annual November 8th Birthday parties those fortunate remaining 'cottagers' could always retreat to 'Bellefontaine' where their identity and status were confirmed and proclaimed ! The Birthdays became a gesture of unity ! Mr. Jenkins held his position of Superintendent from 1897 until the estate was dispersed in 1946 ~ almost a half-century ! statuary removed to the woodlands near the horse cemetery along the service road south of where the greenhouses were located. Much of it broken as care was not given in the removal. Some pieces were acquired by what became the 'Avaloch Inn' on the hill above Shadowbrook. Better pieces were acquired by George Bisacca for his Eastover Resort on the former Fahnestock estate. These would include the columns supporting the lions, and the lions themselves ~ besides portions of the east and west terrace fountains. Those pieces are still at Eastover, near the motel-like complex south of the mansion. The marble copies of the Boboli 'goats' were taken by son, Giraud Van Nest Foster, in 1946, for his Swingalong Plantation in Wilson, Louisiana ~ where they would be today is anyone's guess. A further word on the Bellefontaine statues . . . Cleveland Amory wrote that there were "half a hundred" ~ another person mentioned 1,800 !!! The Jenkins family inventory states 168 statues and ornamental sculptures on the grounds alone, not counting what was in the "big house", as it was termed. Besides, there were five working fountains on the grounds. The largest, along Kemble Street, was designed by Carrere and Hastings and is still there, though not in operation. 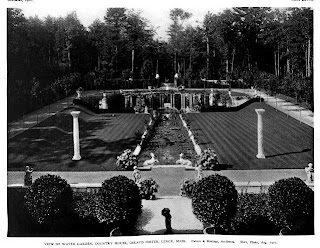 The estate's name, "Bellefontaine" is in reference to the three-tiered "griffin fountain" in the entrance courtyard that faced the reflecting pool and pergola at the far end. 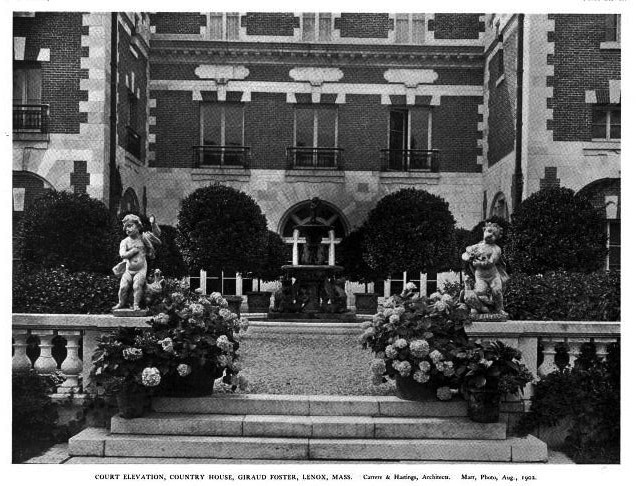 When the house was first occupied by the Fosters, on July 29th, 1898, that particular fountain was not yet in place. For the first few seasons the estate was left un-named and only after it was installed in 1900, or 1901, was the name "Bellefontaine" given. OGD - Great insider information. The name Bellafontaine captures such a wonderful picture of the fountain and is perfect for a country home. 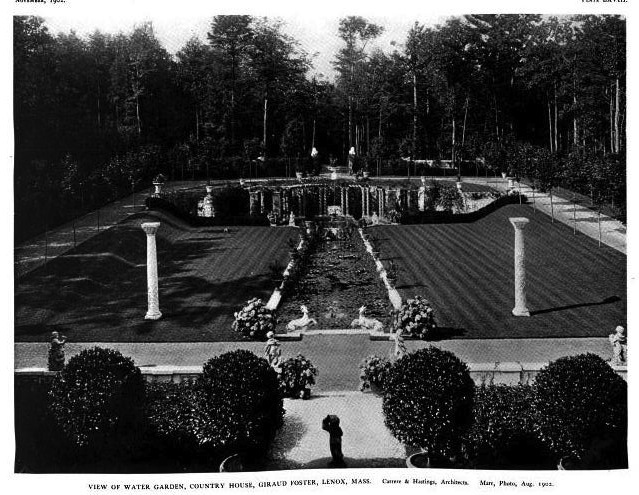 The account of 1800 garden sculptures always did seem a bit exaggerated, but I think the property could use a few of them back in place, definitely too bare and also some nice evergreens to cover up the enormous spa facility. There were two more statues that need to be mentioned ~ those of Punch and Judy that were located out by 'Boy' Foster's playhouse. The playhouse was in a wooded area way down the service road that lead past the greenhouses and the horse / pet cemetery. It was located towards the service road exit on the Lee Road ~ out by Wyndhurst and Coldbrooke. 'Boy', and his playmates, would be supervised by young Foster's governess who was called Mary "Tea". Her last name began with the letter "T", and since she served tea to the children she took on the name "Miss Tea". Isn't this Great Stuff ? ~ I'm smiling to myself here !!! Anyway, young Giraud took Punch and Judy, and the Boboli 'goats', for his place in Louisiana before he placed Bellefontaine up for auction and sale. More on 'Boy' Foster . . . After son Giraud Van Nest Foster was born, in 1904, the parents decided to build a nursery above the east, library, wing that overlooks the courtyard and a matching addition above the kitchen for six additional servants' rooms and bathroom. The nursery suite was as follows . . . the first room off the second floor hallway was a sitting room followed by a self-contained kitchen. The Third room was for "Miss Tea", the governess. The fourth room was Boy's bedroom followed by his playroom that overlooked the courtyard. After these additions were finished the Fosters lived at Bellefontaine year-round for two years ! I mentioned the greenhouses that were located on the south side of the service road that began on Kemble Street ( Route 7 ) and ran all the way to the Lee Road ( Route 20 ). It was the largest greenhouse range in Lenox and covered an area of over 40,000 square feet! The only one in the Berkshires that was larger was the range at Elm Court estate, in nearby Stockbridge. The central feature was the Palm Court that contained a pool where enormous water lily pads grew. One so large that Mr. Foster sat in a chair on it and had his picture taken. 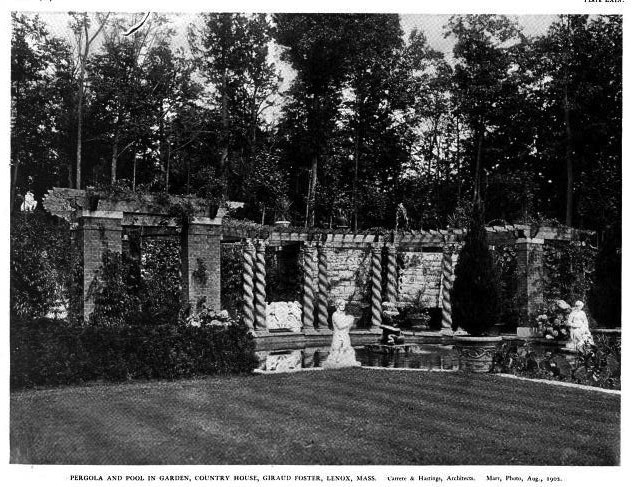 Later he had a lily pond constructed in front of the exedra way out past the east terrace garden and used the Palm House for fig and banana trees. The fig trees were in large containers three feet in diameter, and had to be cut back every winter ~ they were almost fifty years old ! The banana trees grew so tall that they almost touched the top of the glass roof ! The greenhouses had seperate sections for nectarines, melons, and grapes. Only those bunches of grapes that were without blemishes were sent to the big house . . . the others were given to the people who worked on the place. There was one section just for the chrysanthemums that Mr. Foster loved. Some were as "large as dinner plates". On the nights of Mr. Foster's birthday, November 8th, almost all the mums were transferred to the big house for display. Five men worked in the greenhouses. "Bob Finney was the only American; the others were all English or Scotch." In July, 1946, when the property was up for sale, the greenhouses were still in perfect condition, well stocked and running ! Superintendent, Edwin Jenkins, had seven men working on the estate full time, with seasonal help added in the summer months. flanking the reflecting pool were remembered as "quite a feat to put in place" ~ which took place on September 5th, 1899. A day remembered because it was the date of birth of his daughter Alva Jenkins ! to be continued . . . next installment will begin reminiscences of Giraud and Jean Van Nest Foster. As promised ~ memories of Giraud and Jean Van Nest Foster from Alva Jenkins Sward, Bertha Jenkins Goutell and Millicent Jenkins Simpson, daughters of estate Superintendent Edwin L. Jenkins. To begin with, they cleared up that comment that Giraud Foster "made all his money in one day ~ he married it!" The daughters all stated that Mr. Foster was wealthy in his own right; his wife, Jean Van Nest was far wealthier though. It was Mr. Foster that did all the business ~ paid all the bills and kept close watch on the estate's expenses. Mr. Foster made an arrangement with George Westinghouse, whose nearby estate, Erskine Park, had its own powerplant, to bring electricity to Bellefontaine in 1897; before many other neighboring estates had it ! Every day Mr. Foster, and Edwin Jenkins, would walk all over he estate to review what work needed to be done. Superintendent Jenkins would go up the the "big house" every morning to have a conference with Mr. Foster first, then he would go upstairs to have another conference with Mrs. Foster who would be sitting up in bed wearing a picture hat. It was not considered improper as long as she had her hat on ! Mrs. Foster would talk about what flowers she wanted for the house, and produce from the gardens and greenhouses. The Fosters would come to Lenox in late May, after a fishing trip up in Quebec. Often during the summer they would return briefly to New York on business matters, staying in one of the big hotels. They might also visit friends in Bar Harbor or Tuxedo Park, or Mrs. Foster's sister Anna ( Mrs. Richard Gambrill ) at Vernon Court in Newport. Bellefontaine would not be closed after the Fosters left in October, but they would return for Christmas. A big Christmas tree would be set up near the fireplace in the hall and the employees and their families would be invited over for a luncheon and to receive gifts ~ that were distributed next to the tree. The Fosters would stay until New Year's, then travel to Aiken, So. Carolina for the winter equestrian events. Later, Palm Beach, Florida, would be the winter destination. Though the main gate, next to the Superintendent's lodge, was the formal entrance Mr. Foster prefered to use what was termed the "woods road" several hundred feet to the north on kemble Street ( Route 7 ). This passed through the pine forest past an ancient statue fronting a row of Byzantine columns, at the bend, and lead to the rear of the pergola then divided to approach the house on either side of the waterway. He would also take this route on his walks to Trinity Church on Sundays. In his later years Mr. Foster, accompanied by Edwin Jenkins, used to go for lengthty walks on the estate ~ also for drives through the countryside. Mr. Jenkins could converse with Mr. Foster on any subject he would bring up, being so well read. Regarding Giraud Foster's great annual birhday parties, one writer would say that the practice began in 1915 when Mr. Foster was 65 years old, inviting 65 guests! "If you were not among the original elect you would never be invited." Edwin Jenkins' daughters took issue with that. They remembered that those elaborate birthday celebrations began when Giraud Foster was eighty years old, in 1930, and that there were so many guests that some had to be seated in the breakfast room adjoinig the dining room. Mock turtle soup was always served and the left-over was always sent to the Jenkins family, tureen and all! Mr. Foster was playing cards, with three friends, at Bellefontaine, when he suffered a heart attach on Saturday, September 22, 1945. He, his wife Jean Van Nest Foster, and later son Giraud Van Nest Foster, are buried at the Church on the Hill Cemetery in Lenox. Edwin Jenkins' daughter, Bertha Goutell, wrote to me the following . . .
"We feel more deeply than ever the marvel of what it was, and the kind of life that all people on the place lived, for a period of half a century or more ~ I don't suppose there will ever be as opulent and grand a life style as was carried on in those times, and we were fortunate to be a part of it !" This final comment on Bellefontaine is compiled from the reminiscences of Millicent Jenkins Simpson, daughter of the estate's Superintendent, Edwin Jenkins. Millicent's husband, A. Kenneth Simpson, was the Director of the Berkshire Garden Center, in neighboring Stockbridge, for a period of fifteen years. 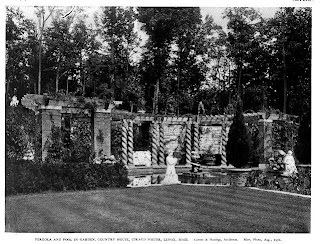 Afterwards was Horticulturalist for the Rockefeller family at Pocantico Hills, New York, until his retirement in 1968.
the estate was private people could always view the formal Blue and Gold Garden down by the highway. All the flowers were blue snd yellow, and the big fountain was full of lily pads and goldfish. On a Sunday there were so many people that there might be cars parked along the road for a quarter-mile! Dad's contribution was in making Bellefontaine one of the show places of the golden years of Lenox ~ and we children were blessed, indeed, to be part and parcel of it all. The whole family, mother, dad, and all us seven children loved Bellefontaine, Lenox and the Berkshires with a passion. It was always home to us because we loved it so ~ the seasons, the people, the beauty of the landscape's flora and fauna. We enbraced it and were enbraced in turn. Father and mother were both much beloved; not only by us, but by all who knew them. My sisters, and I, find our present lives very satisfactory, but nothing will ever take the place of the Berkshires and Lenox of the good old days! flanking the reflecting pool were remembered as 'quite a feat to put in place' ~ which took place on September 5th, 1899. A day remembered because it was the date of birth of his daughter Alva Jenkins !" Incorrect ~ Alva's name was next to the story in my notes because it was she who told me, but it was not Alva's birthday but one of the other children's. Her brother, "Red" Jenkins' name appears above this story in my notes so I'm assuming it was HIS birthday that took place on that date.